This blog has a new good friend, the collector Ray Hepner, who is very kindly allowing me to show some items from his archive over the next few weeks. 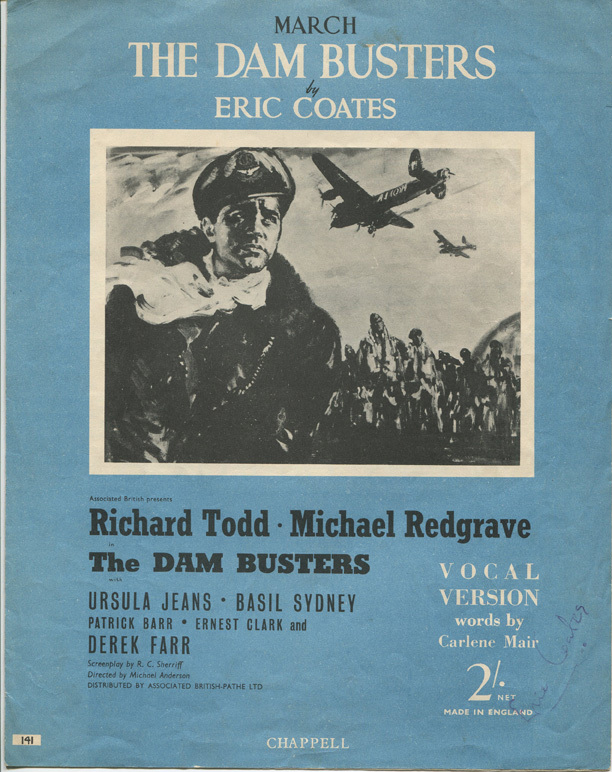 The first of these is a copy of the sheet music for The Dam Busters March, autographed by its composer, Eric Coates. The item shown above is the vocal version with words by Carlene Mair. To my mind, these are rather better words than the rather dirge-like recent hymn, about which I posted last June. Not much seems to be known about Carlene Mair, other than that she wrote a book about the history of Chappell, the music publishers, and also the words in English for Chappell’s collections of Bavarian and Welsh folk songs. She also wrote an English translation of Charles Trenet’s La Mer, but not the words to Beyond the Sea, which uses the same tune and later became a hit for Bobby Darin. 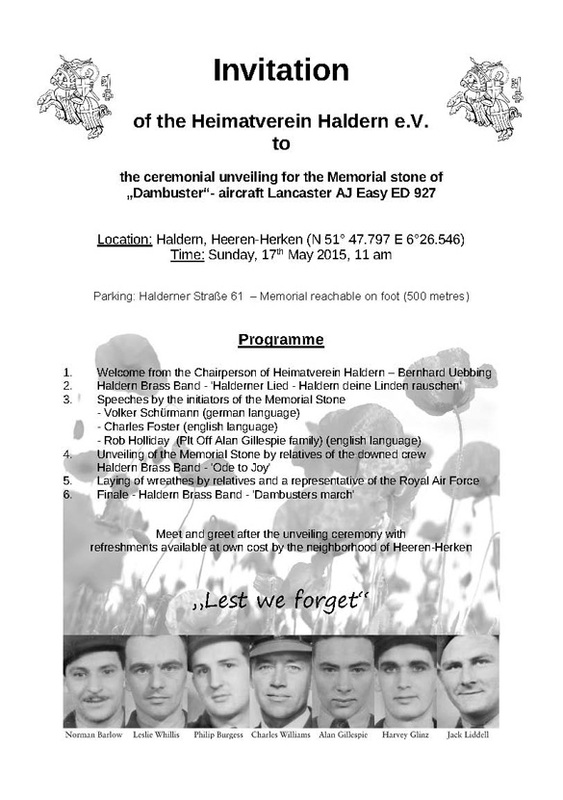 Any further information would be gratefully received. David Rodger was born on 23 February 1918 in Sault Ste Marie, Ontario, Canada. He went to the local technical school and then worked for the Algoma Steel company. He joined the RCAF in October 1941, and trained as an air gunner before leaving for the UK. By then he had also been commissioned. 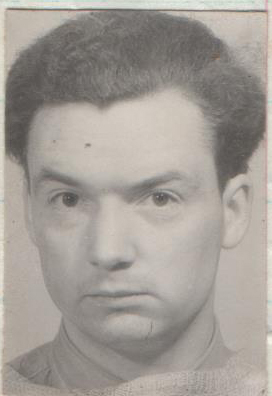 In September 1942, he joined 97 Squadron at RAF Woodhall Spa and took part in one operation on a trip to Bremen in an aircraft piloted by squadron CO Wg Cdr G D Jones. He then suffered a broken kneecap in an accident, and had a spell in hospital. 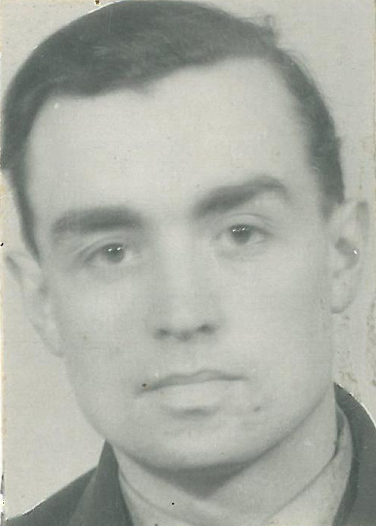 In January 1943, rear gunner Sgt Ralph Muskett was forced to stand down from Joe McCarthy’s crew after prolonged bouts of air sickness, and Dave Rodger was selected in his place. He thus became the third member of the RCAF in this crew. He went on to take part in 15 operations with McCarthy in 97 Squadron before they were all transferred to 617 Squadron in March. Before the Dams Raid, all the rear gunners had set up the turrets of their scheduled aircraft in the way that suited them. Most chose to have the Perspex windshields removed, beliveing that they had better visibility without them and each would have made further adjustments to their seats and gun positions. When the McCarthy crew had suddenly to switch from the allocated AJ-Q to the spare AJ-T, none of these refinements had been made. Fortunately, Rodger was given a few minutes extra while McCarthy himself went off in hunt of the missing compass deviation cards so he was able to remove the Perspex, with the help of ground staff. 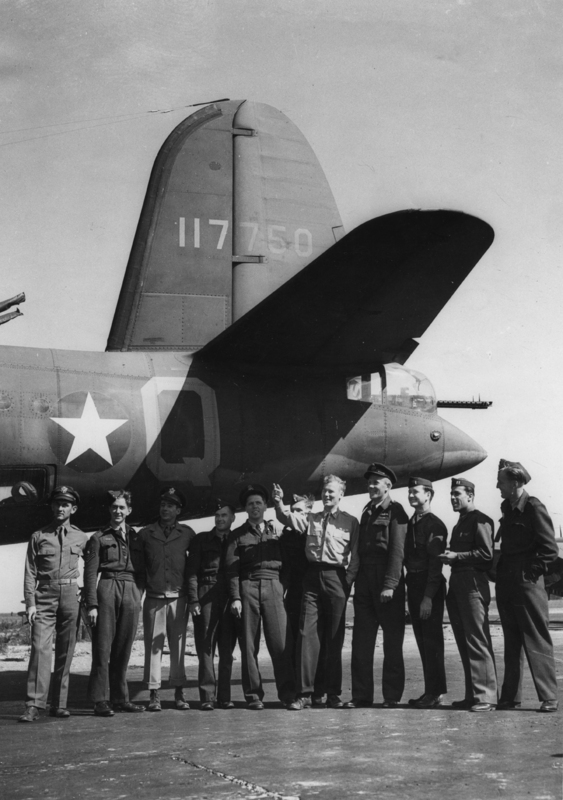 Rodger continued to fly with McCarthy throughout the rest of the crew’s tour. He became 617 Squadron’s Gunnery Leader on 11 September 1943, was promoted to Flight Lieutenant and received the DFC in 1944. The citation noted “his calm resolution in the face of the heaviest opposition, which has been an inspiration to his crew”. 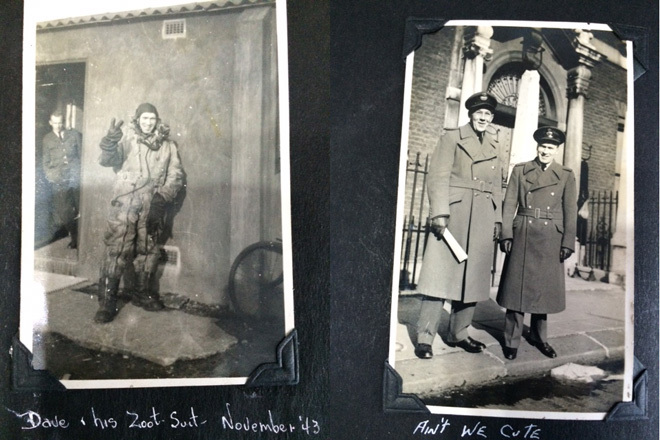 When he was stood down from operational flying, Rodger was offered the chance to return to Canada and work as an instructor for the rest of the war. He decided to take the opportunity, and on his return he married his Canadian girlfriend Nell Barbet. Whilst in the UK he had secretly been taking dancing lessons in order to impress her. After the war, he returned to work at Algoma Steel in his home town of Sault Ste Marie, and stayed there until retirement. He and Nell went on to have nine children. 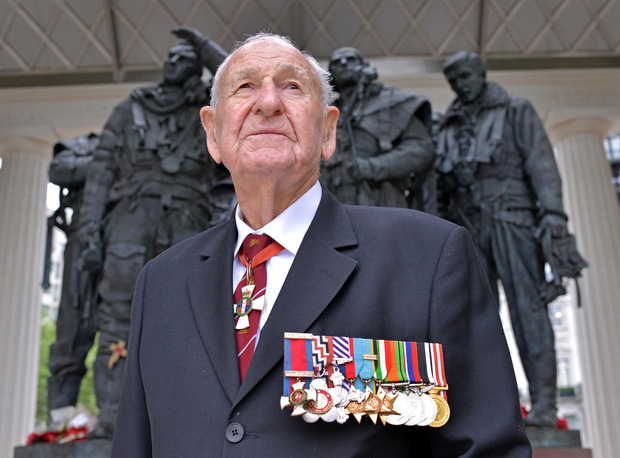 Dave Rodger took an active part in many Dambuster reunions in Canada and travelled to the UK on several occasions. Joe McCarthy and he last met up at Rodger’s 80th birthday party in 1998, shortly before McCarthy’s death later that year. Dave Rodger died on 1 September 2004. He was cremated locally and his ashes scattered in his own garden, and at the family cabin on Lake Superior. Thanks to Patti Rodger Kirkpatrick and the rest of the Rodger family for help with this article.